The average American browsing the web probably never worries a lot about who controls the Internet Corporation for Assigned Names and Numbers (ICANN) – but they should, and likely will now that President Obama is giving up America’s oversight of ICANN. Since U.S. government research funds made much of the early Internet possible, beginning in 1998, when the Commerce Department issued it a contract, ICANN has managed a number of technical functions that help computers locate the correct servers and websites. The contract between the Commerce Department and ICANN is set to expire in September 2015. The Obama administration has announced that it does not intend to renew ICANN’s contract and will transition its functions to some “new form of multistakeholder oversight,” possibly a new organization assembled from the various international bodies that have an interest in how the Internet is managed. According to The Wall Street Journal, the main goal is to reassure other countries that the U.S. isn’t secretly controlling the structure of the Internet. To the extent American businesses have been damaged by the Edward Snowden disclosures, especially those offering cloud and other online services, this is a move aimed at repairing the relationship between the U.S. and other countries on Internet issues. Make no mistake; this is a major concession by the U.S. While the Commerce Department rarely intervened publicly in ICANN’s affairs, the implicit threat of its ability to do so will be gone. That could have an unforeseen impact in the future, particularly if cyberweapons continue to play a larger role in military and counter-intelligence activities. While the Obama administration claims that a main objective for the U.S. is to make sure that the U.S. Commerce Department isn’t replaced by the U.N. or another governmental organization there’s no guarantee that after the U.S. relinquishes control the body taking over from ICANN won’t hand the Internet over to the U.N. or be dominated by the governments of countries that have strong Internet censorship in place, such as Communist China and Islamist Iran. Some establishment Republicans, such as South Dakota’s Senator John Thune, voiced initial support for the Commerce Department plan and are inclined to go along with Obama’s giveaway of America’s digital sovereignty. Others, such as South Carolina’s boat-rocking Senator Tim Scott, see the threat to free speech and the free exchange of ideas in such a giveaway. “While I certainly agree our nation must stridently review our procedures regarding surveillance in light of the NSA controversy, to put ourselves in a situation where censorship-laden governments like China or Russia could take a firm hold on the Internet itself is truly a scary thought,” Scott told Politico. After its own overreach and unconstitutional surveillance of Internet communications were exposed, the Obama administration’s answer to other countries concern “that the U.S. isn’t secretly controlling the structure of the Internet” is to give control of the Internet to countries that do, or would like to. 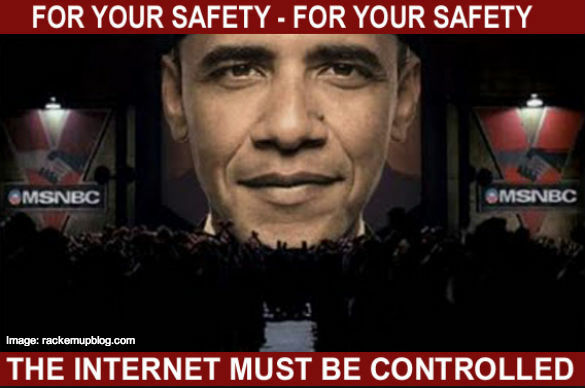 The Obama administration’s fecklessness and naiveté are on full display in the announcement that it plans to end the U.S. government contract with ICANN and sever the Internet from American constitutional protections, because make no mistake that’s what is occurring here. If Republicans and free speech advocates allow the Obama plan to end the U.S. government relationship with ICANN to go forward it will remove American constitutional protections from what is arguably the last free place on Earth and there will be no means of reestablishing them once they are gone.